The latest instalment of the Force Quest officially introduces us to the newest user of the Sage Force; the mysterious and absolutely untrustworthy Pysch. 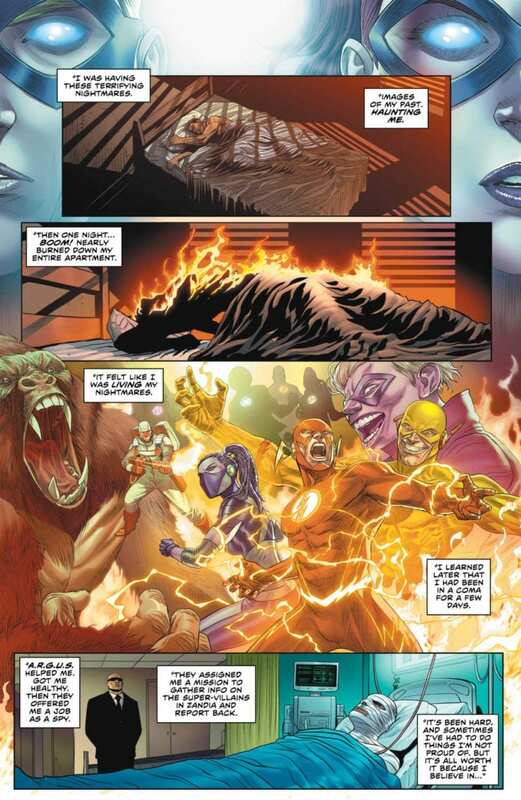 In a tale that involves a heist, a betrayal, the return of some newer villains and some of the freshest art seen in the book for a while, The Flash #62 pops with visual and narrative appeal that is sure to make any Flash fan happy. With the Flash being sought out by Pysch, after his presence was known in Zandia, this newly introduced character sets out a mission for Flash that he seemingly can’t refuse. After connecting with the mind reader on a level that he had only felt with Fuerza before, Barry feels compelled to aid this A.R.G.U.S. operative with the task he has been set; taking down Roulette, a betting-based villain and her personal security of the Royal Flush Gang. Already setting itself up for a lot of gambling puns, The Flash #62 leans heavily into the fun of its villains. Of course, Roulette’s illegal operation is quickly brought down by the Flash and his team. Unfortunately, during the process Pysch manipulates the situation in order to use Barry as bait for the villains. It’s a distraction that pays off well enough to invade Roulette’s mind for all her dirty secrets and blackmail her in the future. Back in Central City, we get a glimpse of the mystery unfolding for Captain Cold and Detective Burns. The two chase down a criminal only to discover a hidden underground lair. It looks to be that of a villain like the Trickster or the Toy Maker, but I cannot be certain. It suggests there is a larger criminal mastermind at work who is coordinating these events that are heavily linked to the Flash’s own mission. Back in Zandia, the events quickly break down, with Pysch clearly being just as untrustworthy as Iris had feared him to be. The mind reader had used his abilities in order to capitalise on the vulnerabilities of Barry, a thematic lesson for The Speedster to learn as the self-proclaimed Robin Hood draws on his negative emotions in order to manipulate and disarm him. 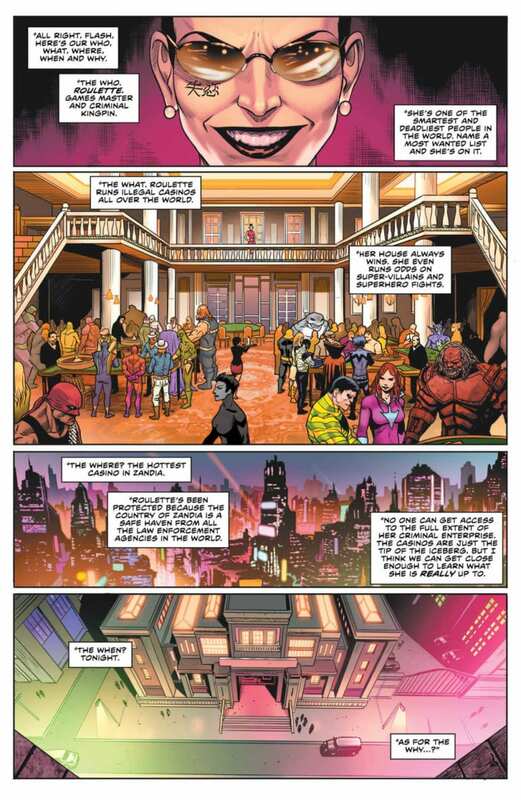 Whilst more time could have been given to further character work, a lot was successfully achieved in The Flash #62 and it is evident that some sufficient planning was in place in order to ensure each part of the Force Quest unveiled something new about the Scarlet Speedster and the relationships with those around him. Plus, there is significant foreshadowing of what is to come. The Flash #62 is jam-packed with strong moments throughout that were both visually and narratively interesting to read. The Flash goes Undercover with the newest Force User! The Flash has spent the past few weeks on a quest to find fellow Force users. The first he has found is the heroine, Fuerza, in Corto Maltese. The pair learns from each other, but things take a turn when they’re attacked by a corrupt police captain. Fuerza, who has been fighting his corruption for months now, wishes to kill him. The Flash, ever the hero, stops her. This causes her to turn her back on him, sending Barry off to his next location. Flash and Iris find themselves in Zandia, a nation run by criminals, to find the wielder of the Sage Force. Turns out the wielder, Psych, is a big fan of the Scarlet Speedster! Will this user become an ally to the Flash? After meeting each other, Psych explains to Flash what he’s doing. The kingpin known as Roulette has illegal casinos all over the world, amassing in a gambling empire. Psych, an agent of ARGUS, has been sent in to stop her. With his subsequent control of the Supervillains, Iris has a few doubts, but Psych explains his origin. This is enough to get Flash on his side, and the trio sneaks into Roulette’s gambling hall. As the plan begins to get underway, Psych believes they need a distraction. This distraction involves him exposing the fastest man alive to this small nation of criminals. I am on the fence about our new Force user. While his design and use of powers are cool, we already had an antihero Force user. He does take a turn for the more evil side in the middle, but some variety would be better. I’m not saying have him be either full out hero or villain, but maybe someone still fresh in the game. I do like the setting the story takes place in. It puts Flash in an element we don’t usually see him in. Most stories, he’s in Central City, where he can run fast a free. This one, however, he has to play the stealth card to survive. I was at the edge of my seat as Flash and Psych snuck into Roulette’s hall. It felt like a spy movie, right down to fighting their way out. It’s an enjoyable issue with a cliffhanger that leaves me clamoring for the next. The illustrations of Christian Duce have grown on me throughout this story, and it hit it’s peak this issue. The characters and action haven’t looked better, with the throwdown at the Casino being the highlight. The only thing that makes this art better is the fantastic colorwork of Luis Guerrero. He’s able to find a balance between vibrant and subdued to keep the world exciting yet realistic. It’s an excellent pairing for a good arc, what else can I say? 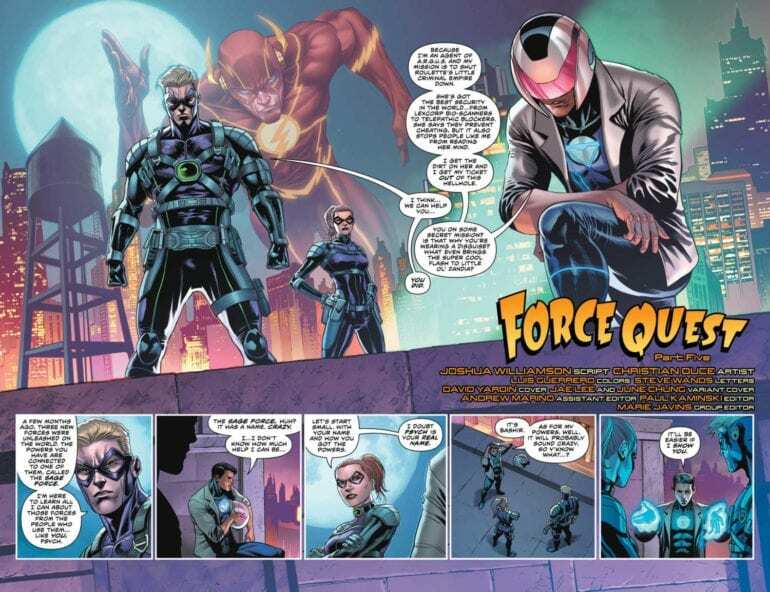 While I might not be a fan of our new Force User, this was still another fun chapter of The Flash. The action in the criminal nation kept me on the edge of my seat, and the cliffhanger has me counting the days until the next issue. The art is very well done and has finally found its stride for the Force Quest. If you’re a fan of the Flash or heist stories, you might want to take a look at this one.